Well here it is the first day of Spring and we have a forecast for more snow in NJ! Par for the course with this Winter season on the East Coast. In fact the kids have a half day due to the predicted snowy weather. Go Figure! 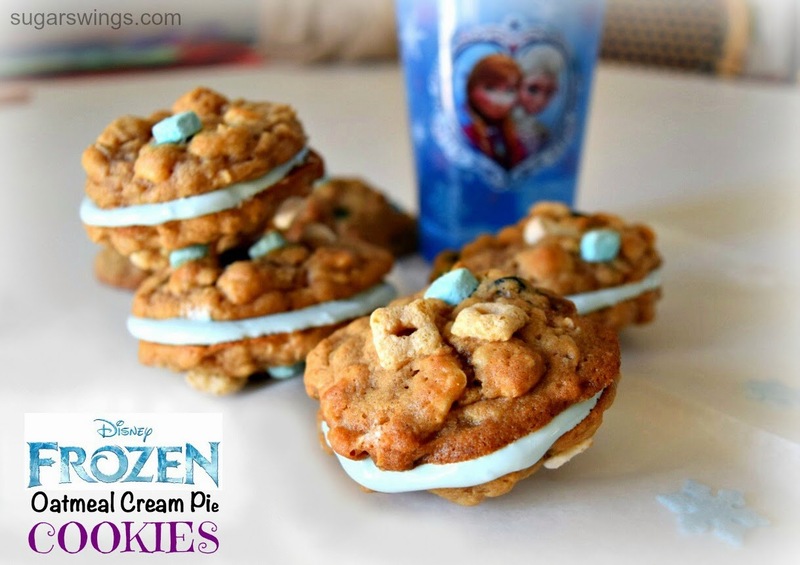 So as a last winter treat, I'm sharing some Disney Frozen themed oatmeal cream pie cookies! Have you seen this cereal in stores? 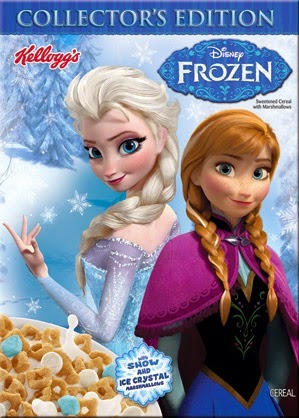 A "Collector's Edition" Disney Frozen cereal by Kellogg's. It has Snow and Ice Crystal marshmallows! 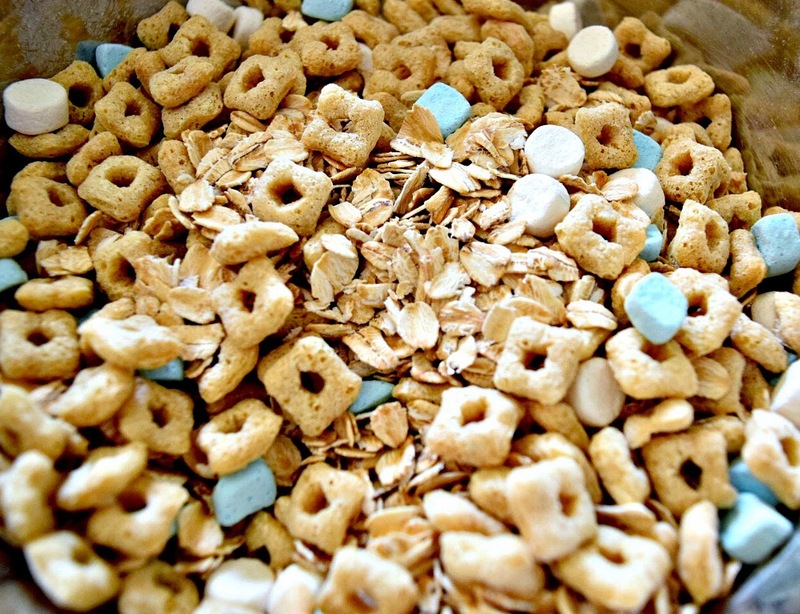 Think Lucky Charms cereal but with blue and white marshmallows. It works because my kiddo immediately had to have this cereal. We don't eat junkie cereals as "cereal" but I do let them have it as treats. I had to make something with them so decided on some oatmeal cookies, because not only are they delicious but I also swapped out some of the oatmeal for the Frozen cereal. I used the Vanishing Oatmeal Cookie recipe that comes on the Quaker Oatmeal can lid! Can't go wrong with that recipe. 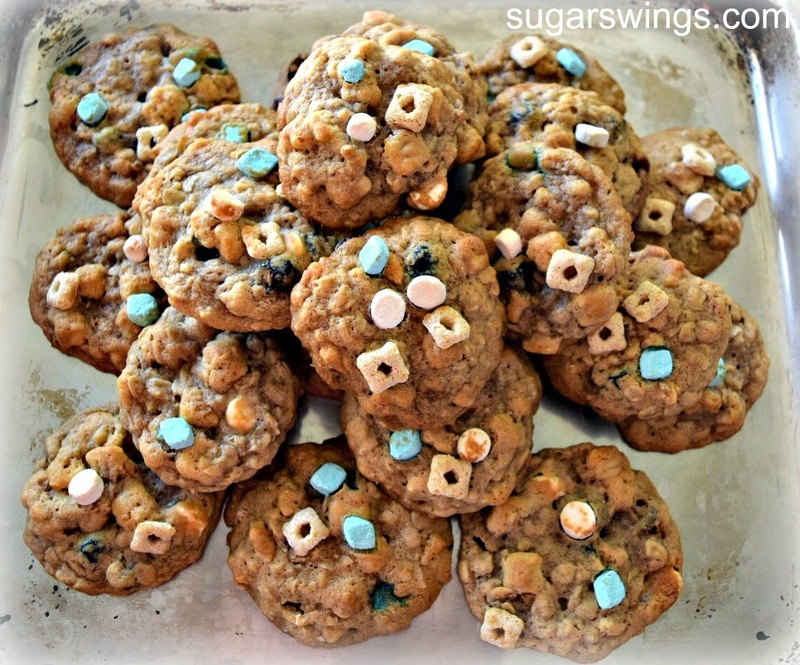 I also added dried blueberries in place of raisins to keep with the "blue" theme. 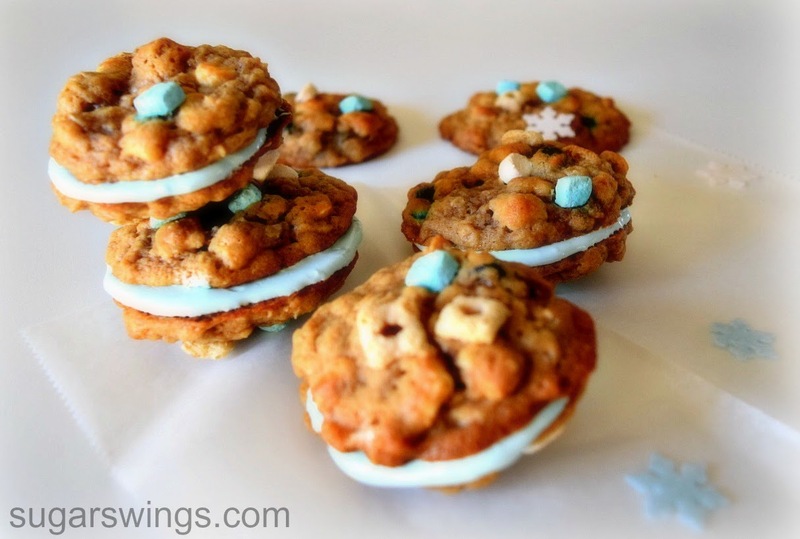 Add to make them into oatmeal cream pie cookies, add a huge slather of some light blue tinted filling. I used a mix of marshmallow fluff and cream cheese. Make them today and devour one on Winter's last hurrah. Have a totally awesome weekend and thanks for swinging by! More spring-y treats to come soon! Preheat oven to 350 degrees. Mix butter and sugars until fluffy. Add eggs and vanilla and mix. Combine flour, baking soda, cinnamon, and salt. Add 1/2 flour mixture to the butter mixture and mix well. Add remaining flour mixture. Mix the oats and cereal together and gently mix into the batter. Add in dried blueberries. 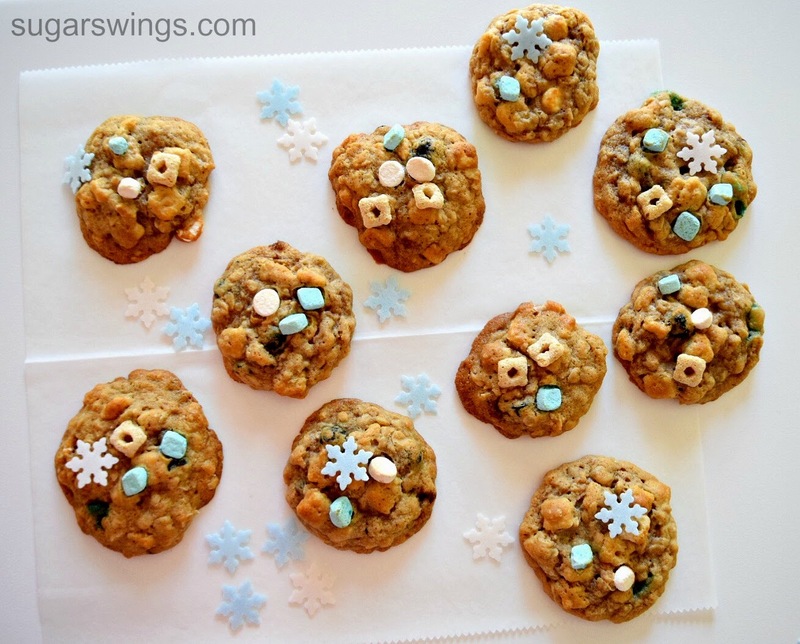 Drop rounded spoonfuls onto parchment paper baking sheet and bake for 8-10 minutes. 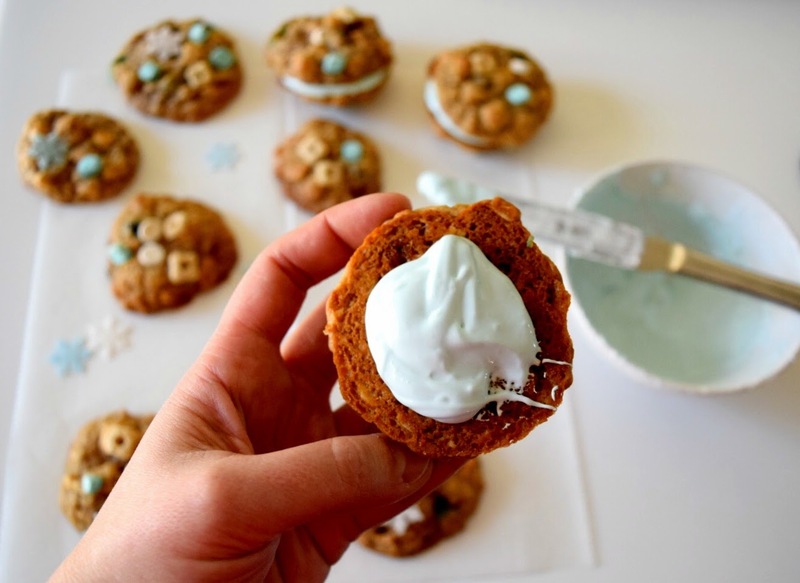 For filling, mix 2 cups of marshmallow fluff with 1/4 cup of cream cheese. Spread between 2 cooled cookies and eat!